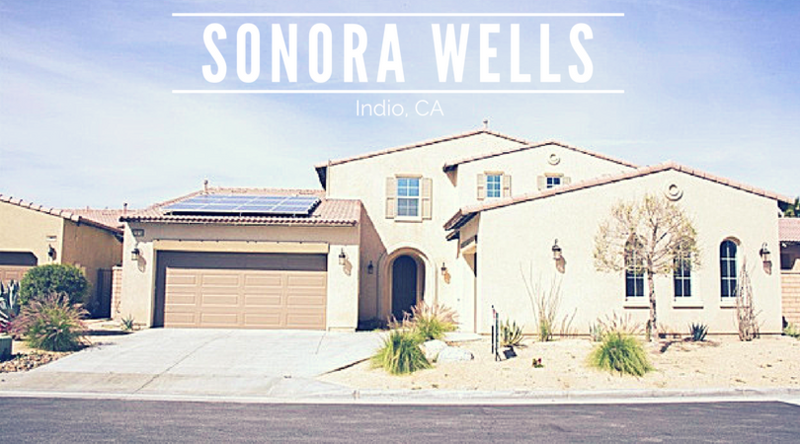 Sonora Wells is a gated community in Indio California just north of Avenue 41 with two entrances, one on Gore Street to the west and the other on Jackson Street to the east. This community has dozens of homes priced from about $230,000-$400,000. Most of the homes are four and five bedroom layouts from 1500 ft.² to a little over 3000 ft.². Lots are between 7590 500 ft.². Any given time there's about 5 to 10 properties for sale. Homeowner association fees are roughly $160 per month and it covers common area maintenance and landscaping. The community features a swimming pool, spa, and small Park. These homes were built between 2002 and 2007. Homes are part of the Desert Sands school district and are served by the Andrew Jackson Elementary school and the Desert Ridge Academy. Most common amenities and commerce are found just down Jackson Street with the Winco Foods, Toys "R" Us, 24 Hour Fitness, and the Indio Town Center plus easy access to Interstate 10. The following stats are for the city of Indio. If you would like specific information on Sonora Wells, please contact my office today.